After Darwin’s emergence as a popular writer and a leading geologist, he turned to some thoughts that had been nagging him about species change. Darwin would devote the next decade to theorizing about the evolution of species. Darwin began with an eight-year investigation of barnacles. 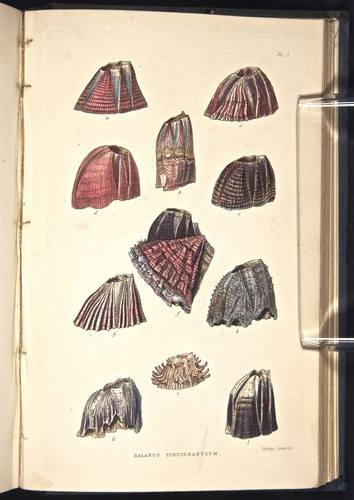 In 1851 and 1854 Darwin published two monographs on barnacles containing page after page of depictions of both living and fossil forms. It may seem strange that after launching his career as a global voyager, Darwin then retreated into his study to spend eight years preoccupied with barnacles! Yet scrupulous study of barnacle variation provided him with an ideal laboratory to forge his ideas about species change.